Moving on from the Marcus Mariota hype train was an experience filled with immense struggle. With the recent news of Eastern Washington standout quarterback, Vernon Adams Jr., deciding to transfer to the University of Oregon for his final year of eligibility; the fear of struggle has turned into hope for next season. Recently, a bleacherreport.com article analyzed the ten teams that are a ‘lock’ to win 10 games or more this season — your Ducks were listed as one of the 10. It’s amazing how quickly and confidently Duck fans have moved on to next season. In the midst of losing one of the greatest quarterbacks ever to play college football, it seemed like all chances had been lost. Just like Mariota emerged out of nowhere to take over for Darron Thomas, Adams or one of the other QB’s will do the same this year. 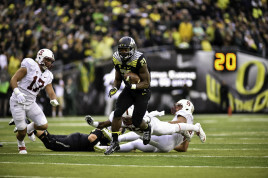 Royce Freeman; a human wrecking ball. The amount of talent that return on offense is unlike any other returning class the Ducks have ever had. There will be no lack of experience on the field for the Ducks because Bralon Addison, Byron Marshall, Darren Carrington Jr, Dwayne Stanford, Royce Freeman and Thomas Tyner are all set to return. Also, the Ducks may have the return of Devon Allen and Pharaoh Brown (Allen more likely to return at some point during the season than Brown). New recruits, Kirk Merritt, Malik Lovette, and Taj Griffin seek to provide a spark in addition to what already looks to be an offensive powerhouse. 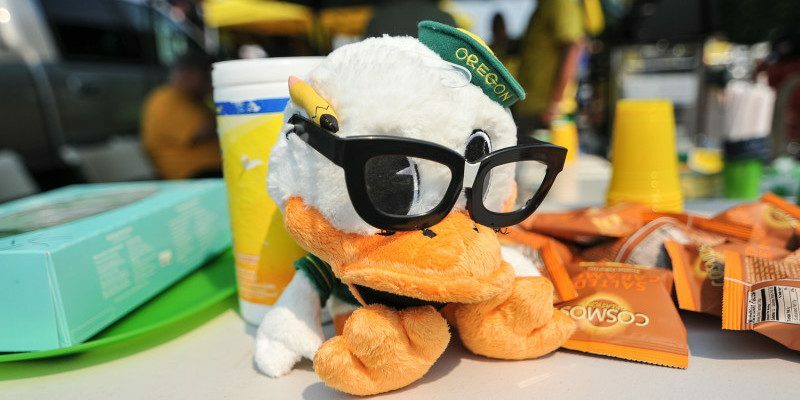 However, most Duck fans tend to revert back to the common cause of worry — the defense. Rarely does a team have a Top 10 offense and a Top 10 defense. Look for the most experienced Ducks cast of DeForest Buckner, Joe Walker, Danny Mattingly, Alex Balducci, Tyson Coleman and Chris Seisay to return to provide stability and leadership. I can’t wait for the 2015-2016 pump-up video to come out! Ducks fans … have faith in the system, have faith in the players, and pray for the opponents who come in the way of our Ducks next season. The green and yellow seeks to dominate the Pac-12 and show why they belong in the playoff yet again. Deforest BucknerMarcus MariotaOregon Ducks FootballRoyce FreemanVernon Adams Jr.